When we make the A.I of our npcs they should know if the target they want to follow is to the right or left relatively to them. This function give us in return the Position of the given Transform, basically if our gameObject orientation is parallel to th y axis all we would have to do is a verification on the x by comparing MyGameObject.Transform.Position.x and MyTarget.Transform.Position.x . 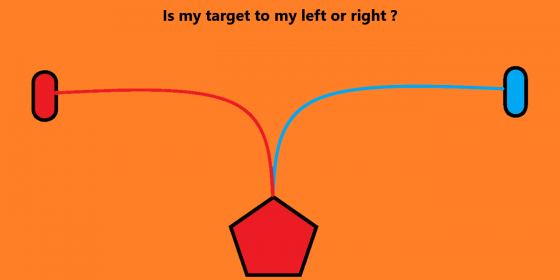 If the transform of the Target is smaller than our position then the target is to our left, otherwise, if it is greater, it’s to our right and if it’s the same the target is in front of us. The problem is that our npc will rotate and it’s left will no more be just be given by a comparison of the worlds axis’s x. So By using the InverseTransformPoint(Transform.Position) what we do is getting a plane point relative to our orientation. Then if the returned point X is Lower than Zero the target is to our left, if greater it’s to our right. This will work both in 2D and in 3D and by changing the compared axis we can change to the needed orientation.